"If only I could have the bass driver & alignment from the Tankk 15 with the cabinet construction of the Whizzo Wengeand the tweeters from the Silkki Smuthie, then I would have the perfect speaker for my system." That is the time many TNT readers get out the driver catalogues, the credit card and the table saw; go forth and build their own. 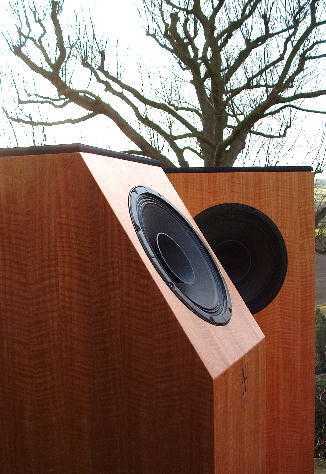 For those of you reluctant to risk fingers in table saws there are many small volume manufacturers producing uniquely flavoured loudspeakers in small numbers to suit the needs of those maverick listeners who can't be satisfied by the big players from Kef to B&W or Sonus Faber to Wilson Audio. "The dream of every single-ended tube amplifier owner is to find the right solution from the high-efficient speaker world; Speakers that features crossover-less full bandwidth with fast trasient response and deep bass together with high frequencies and uncompressed mid-range." "Magna Acustica features a 10-inch driver with a frequency response of 65 -18 000 Hz in free air and efficienny of 96 dB. Two drivers are used with one in the rear facing upward at and angle of 45° and the other in the front facing forward. "The enclosure is catogorized rather under a "semi-open baffle" concept. It has its bass opening at the top, between the two drivers. Standing waves are diminished with the concept of a broader front baffle and a narrower rear baffle. The enclosure is made of plywood marine and then laminated in maple finish. A grille cover on top prevents the speaker from being a huge ashtray"
Lothar explored the possibilities of horns, but he did not find their particular bundle of compromises suited his needs. Big driver big sealed-boxes also brought a slough of problems of their own, so Lothar returned to the ealiest moving-coil driver alignment ever tried, the open baffle. The open baffle has a number of characteristics that make it useful and some that make it a nightmare to impliment. It is theoretically the only "first order" (rolloff at 6dB per octave) bass alignment. As many readers will know, the first order filter alignment (a bass alignment is just a high-pass filter) is the one with the best transient response and the best overall behaviour in the time-domain. Music is merely modulation in the time domain so this is a good thing. The open baffle also avoids all the air pressure control problems of the enclosed or reflex box, and the standing waves therein. However the open baffle, by its very nature then invites a whole different set of cancellation (& reinforcement) nodes (& antinodes) in any room and so requires completely different placement from the closed box. The out-of-phase wavefront from the rear of the speaker produces nulls in the soundfield along the baffle plane, which is also a good thing in many situations, but demands room rearrangement. However the baffle has to be half the size (in both dimensions) of the wavelengths of the lowest frequency to be produced. This demands a baffle of nearly 4metres diameter (depending on altitude & humidity) for the full range of a bass guitar. There are clever ways to overcome this, by integrating the room boundaries into the effective baffle (the popular placement of Quad electrostatics against the side walls being a perfect example) but these require that the room be suitably proportioned and solely dedicated to the hi-fi, as it should be. Glibert Briggs described various schemes to make the open baffle more domestically acceptable, although filling it with sand was probably not the most domestically acceptable to the 1950s houseproud. Lothar's solution is to fold the baffle in on itself and mount a second modified Ciare driver facing rearwards. The in-phase rear driver makes the Magna Acoustica into a bipolar radiator rather than the traditional open-baffle dipole. The two drivers are wired in series so there is no gain in sensitivity over a single driver as the doubling in surface area is matched by the doubling in impedence. The high impedence will suit valve amplifiers of all output configurations (SE or PP, transformer-coupled or OTL) but I still recommend using the 8 ohm tap for flatter frequency response. To me, the folded box arrangement with top openning now looks like a classic Helholtz resonator (of which conventional reflex, or vented, enclosures are but one example) but Lothar maintains that it behaves more like an open baffle. In some ways it looks like it could behave, at certain frequencies, like a special case of labyrinth or tuned quarter wave pipe (TQWP), with the drivers mounted at the open end rather than at the closed end. There is no reason why such an arrangement should not work, just try blowing over the neck of an open bottle for a demonstration. Pipes tend to roll-off bass between 6dB per octave (stuffed Bailey type transmission line) and 12dB per octave (Voigt pipe) at the octave below the corner frequency, increasing to 18-24dB per octave an octave or so lower, like reflex enclosures do from their corner frequency downwards. The relationship between the dimensions of the top openning; the volume of the enclosure and the distance betweeen the openning and the base of the cabinet will change with frequency where wavelengths become comparable to low-integer multiples of those dimensions. The Magna-Acousticas are spookily reminiscent of Stefano Zaini's Embryo's by "The Sound of the Valve" reviewed on TNT by Lucio in 2003, which are a classic Voigt quarter-wave pipe, with the two 130mm drivers mounted about half-way along the pipe but one facing up 45deg to the rear, just like the Magna-Acoustica. The Embryos managed 93dB from their little 130mm drivers while the Magna-Acousticas, with at least 3 times more radiating area of the tiny Embryos (ooh), gain an extra 3dB to pump over 96dB from that first watt. Lucio chose to try two Opera Consonance amplifiers with the Embryos and I have a similar opportunity with the Magnas as a Consonance cyber 100s signature (300B push-pull claiming 22W at 1kHz) arrived for audition as well as my usual modified kitbuilt Assemblage SET300B and puny 4W homegrown SET6080. First impression is that the 96dB sensitivity claim is correct; many manufacturers claim high sensitivity figures based on a peak in the response but these really do sqeeze a full 96dB from the first Watt over the whole passband. As I listen, I begin to wonder if they might tend to behave like a tuned cavity of some kind (TQWP or Helholtz resonator) at the lowest frequencies of the driver range (~65Hz to 150Hz), or a compound of loading types. Above this, from maybe 130Hz to 300Hz, the passband ripple loading arrangements maybe cancelled by the effects of the baffle dimensions (I'm extrapolating from these dimensions) where there will be a region of overlap. Without internal damping or stuffing (there's just ~4cm of acetate fibre wadding over the internal surfaces) there might be considerable ripple caused by cancellation and reinforcement at different frequencies, but this is not obvious on audition, hence the baffle effect hypothesis. This region's output will be aided by the baffle width response-step, a 3dB+ lift around 425Hz due to the constant width of 40cm and sharp corners, near to 'concert A'. The baffle step response (sensitivity gain due to the baffle dimensions and directionality, has been reported by designers and testers, to be as high as 10dB in some cases, so should not be underestimated. Lothar notes the driver's equidistance from 3 cabinet edegs (both sides plus top) is deliberate. Lothar has really considered the drive unit specification to suit this application. The drivers installed in the Magna Acoustica seem to be a hybrid of the Ciare PW253 cone (plain paper, doped paper surround) with the whizzer from the PH250, but with the magnet & voice coil from much smaller drivers. He notes that typical 38mm voice coils on 250mm drivers "always die at 13kHz", so has specified 25mm voice coils despite the power handling compromise that demands. 25mm voice coils typically have about 30% less power handling than the usual 38mm or 50mm voice coils of 250mm units, but gain sensitivity and motor acceleration due to their correspondingly higher bl product, which is the effect of the magnetic field on any part of the voice coil. The voice coils are the 25mm more commonly found on 150mm units than 250m drivers that usually sport 50mm voice coils. Lothar did consider those 38mm voice coils that "always die at 13kHz", but specifying 25mm in this application Magna Acoustica claim a genuine 80Hz-12kHz response with useful output above 15kHz, which I can confirm. The treble roll-off is subjectively remarkably similar to the bass roll-off; this symmetry helps disguise these bandwidth limitations. The 25mm coil on the Magna Acoustica is the usual copper wire-wound (not expensively edge-wound) and overhangs the gap-height. Overhung coils may create dynamic compression, well described in late 80s interviews by Robin Marshall of Epos fame. An overhung coil's length exceeds the gap height of the pole pieces. Underhung coils are shorter than pole-piece height; underhung coils are less efficient and demand bigger magnets. Overhung coils offer better power-handling and as they approach overload they compress gracefully rather than suddenly. Some drive unit manufacturers publish 'transfer characteristic' graphs of cone-movement (Y axis) for volts input (X axis) and overhung coils generally look more like a graceful S shape, indicating their gradual non-linearity, compared to undehung coils reversed Z shape. Underhung coils tend to do better micro-dynamics in my experience. Overhung are better on power-handling & sensitivity compromises; these Ciare manage 150W, which is very loud with a 96dB sensitivity. It will be interesting to hear how these perform dynamically. The drivers are sourced from Italian Manufacturer Ciare (not to be confused with defunct French manufacturer Siare) and resemble those from the professional series PW250/1/2/3/4 range of 25cm units. 25cm is a very useful diameter driver in PA applications, stiff cones begin to beam at about 1500Hz, but the beaming often counteracts the mass related high frequency rolloff resulting in a reasonably even, if coloured, top end ideally suited to guitars & rock group vocals. Lothar has come to similar conclusions as I have, that forming the surround pleats from the paper of the cone, plus applied doping, produces the minimum quantity of cone response irregularities when pushing this type of unit high into the vocal range. Drivers designed for bass only applications use roll-surrounds for better low frequency linearity, but these cause reflections where they join the cone, resulting in midrange abberations. Sadly the chassis is pressed steel which is not as good as a cast aluminium alloy basket; the latter would be more rigid at audio frequencies, resulting in lower colouration and better information retrieval. Lothar sensibly specifies a whizzer cone of 10cm diameter that will improve dispersion to manage about 90degrees until at least 3kHz. Whizzer cones are smaller cones fixed to the same voice coil within the main cone area. On some drive units different glues are sometimes used for the whizzer cone and the bass cone to effect a mechanical crossover (acoustically having a similar result as an electrical crossover between woofer & tweeter) but I do not know if this is the case with the Ciare. At low frequencies the two woofers will act as a point source. At higher frequencies the two drivers will neither behave as a diploe (a dipole requires opposite directions to fire out-of-phase) nor a bipole (as the two drivers are at 45 degress to each other), so the polar response is unusual. Once Magna Acoustica get hold of the drivers from Italy, they coat the cone with a selected resin laquer, and the whizzer with a different compound. Both of these were chosen by test and neither claim any special magical properties, Lothar even jokes about a certain laquer product well known on the internet for its magical claims. The Magnas use normal unmagical laquer with no pixie provenance! When British importer Vincent Lim of VNW delivers and unpacks the first pair, we are both disappointed. The speakers have a poor finish, looking as if a mixture of edge-tape and glue had been used to bodge shortcomings in the veneer. The surface was unsealed, looking as if just one quick pass of a varnish-rag has been hastily wiped accross the surface. The veneer is mostly unprotected by this 'finish' and thus marks very easily. Vincent has not seen any of this batch outside its packaging before and immediately telephones Lothar. This is Vincent's first foray into the import audio business and he is still on a steep learning curve! It transpires that the sub-contracted manufacturing and assembly processes thousands of miles away proves less easy to control than a really uncontrolled thing on a particularly uncontrolled day. Lothar sprang into action and arranged for production of the cabinets to be switched elsewhere, such are the slings & arrows of outrageous fortune of running a start-up audio business. I am promised the first of the new batch. In the meantime I begin evaluation of the first pair, knowing that another pair are due, promising better finish and assembly, which will affect the sound as well as the appearance. Detaching the grille cloth, that covers the top-openning, I was able to peer down into the cabinets to observe appalling jointing quality that will compromise the structural integrity of the cabinets, which will affect cabinet colouration and information retrieval. First impressions will be just that, and only a vague guide of the final sound, but I am keen to hear this novel bass alignment and familiar enough with cabinet construction anomalies to listen through any cabinet colouration. I have very little technical information about these speakers, apart from that gleaned during a brief telephone conversation with Lothar. Most of what is written here is guessed from examining the speaker in the light of experience. Therefore readers should be sceptical about my technical reasoning. Lothar told me that these speakers do not need much time to run-in but that the cables do need a long burn-in time and that the cables would responsible for the initial tight sound. I've worked with new drivers for many years, and my experience is that big PA (public address) drivers need more running in than any other types. Out of curiosity I tried different cables 2 days after the speakers had been playing constantly and the characteristic sound of tight drivers was still there, so I return to thed Magna Acoustica cables & keep playing BBC Radio4 24/7 when not listening to music. Over 2 weeks later my son (12) comments as he walks into the room "the bass has started to kick-in on these speakers now. They're like babies who crawl first (which is like the treble) but then they begin to walk (finding the bass) but don't do it all the time until they're really used to it"
Lothar said that the wires were an inherent part of the Magna Acoustica design and only these should be used. They're a bit short for my set-up so I had to move my power amps to comply. The supplied cables are made from really thin wire (dc resistance is three times as high as my usual cables) which will have an effect on the bass tuning, raising the Q and reducing the so-called damping factor between amplifier and driver. Most passive crossover speakers have a big inductor (choke) in series with the bass driver. This lies between the output impedence of the amplifier and the impedence curve of the speaker. With amplifiers with comparatively high output impedences (single-ended triodes tend to be the highest due to the requirements of the output transformer design) any series resistence affects the ability of the amplifier to deliver a consistent voltage at different frequencies, for example the bass driver impedence rise at fundamental resonance. Lothar designed these speakers to be quite high Q to fill out the bass with the open baffle loading and use of low resistence wire would reduce that effect. I have not run any tests but these speakers sound like a 'maximally flat' bass alignment which equates to Q=0.707 Butterworth filter. Anything approaching Q=1 in a box speaker usually sounds boomy with overhang, and anything above Q=1 (typical undersized puny magnet cheap little boxes) sound too bad to consider on a hifi website. Yet Lothar states that the drivers measure at Q=1.3, calling them "the slowest drivers". The bass does not sound slow like a high Q alignment, if it resembles any traditional type it is more like a tuned quarter wave pipe, but the cabinet dimensions do not support this being only 117cm tall internally which would tune to 73Hz. The driver centre to baffle edge is just 20cm so open baffle theory would predict 6dB per octave rolloff below 850Hz which is also not what this speaker does. I wrote about driver speeds in Speaker Builder (1999) and how commonly higher sensitivity drivers tend to be faster as the acceleration in a driver may be described by dividing the magnetic force product (BxL) by the moving mass. Furthermore, that figure multiplied by the cone area gives a good indication of the dynamic impact of a speaker and is usually proportional to sensitivity (other things being equal). The Magna's do not seem to have the dynamic whack of a typical single 96dB driver aimed at the listener's head, which supports Lothar's explanation. I suspect all other things are not equal, and one of these is that half the potential whack is aimed at my rear wall. Having whacked my rear wall it bounces back to dilute the purity of the wavefront. That rear driver presents the biggest burden of acceptibility for these speakers. The drivers are spaced approximately 62cm between their acoustic centres, though no such thing exists outside the marketing copywriter's vocabulary. Although this would result in a boost of up to 6db at around 500-550 Hz with parallel wired drivers, with series wired drivers it has no such effect. However, there could be a null of up to 6dB at 260Hz with this arrangement, but there is not. Because these are not point-sources these figures are fairly futile. Cancellation or reinforcement can be happening at various wavelengths between cone-edge to cone-edge and opposite cone-edge to opposite cone-edge, and all distances below these wavelengths (i.e. above their frequencies). This is why conventional designers tend to keep multiple drivers to low frequencies where they may be sited within a wavelength of each other unless they are deliberately designing arrays or special alignments like the popular D'Appolito MTM configuration. This is because no 25cm driver is anything like a point source and therefore has no acoustic centre in this context; furthermore, the two drivers are mounted on non-parallel baffles, distributing the null over two octaves and no coincidence that they're the two octaves that tend to be lifted in high sensitivity drivers and also lifted by floor-reinforcement on floorstanding loudspeakers. Either very clever or a lucky accident. Two outwardly facing drivers more than a fraction of a wavelength apart present real challenges to the end user. Positioning these speakers is critical. I do not say that very often as I am not a fan of obsessively critical positioning; we all live in the real world. The necessity of accurate centimetre critical positioning is usually demanded by less than ideal listening rooms. I know my listening room (I designed it and specified every cm of its surfaces) and I tend to find my first placement instinct is about right, and neither my room nor my ears seem particularly sensitive to minor placement shifts with forward firing boxes. 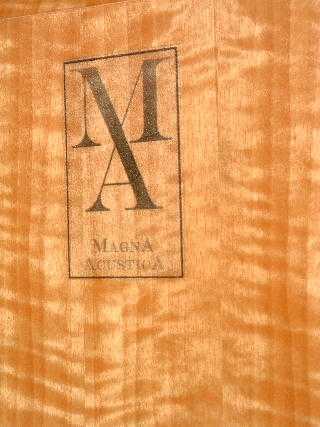 The Magna Acoustica demand more repositioning than any other loudspeaker I have tried in this room. "It's as if the drummer has really long arms"
I end up with the Magna Acousticas further apart that usual and toed-in so that their axes crosssed well in front of the listener. Anything else produces a hole-in-the middle effect, really phasey midrange & treble and disturbing shifts of image with tiny movements of the listener's head. Their final placement echoes curiously the recommended positioning of the linear arrays proposed by E.J. Jordan in the 1960s in his HiFi News article 'Broadenning the Stereo Seat' and no surprise when one considers the Ciare drivers' similar heritage to Ted Jordan's Axiette design for Goodmans in the 1960s. Even with these provisos the excessive cabinet colouration dominates the overall impression, together with a strange soundstage and phasey effects in the treble and alto ranges. The close proximity of various small reflective surfaces above and near the speakers may be contributing to many reflections at high frequencies (small surafces can only reflect short wavelengths) causing wavefronts to combine and add together or cancel depending on their phase at the point where they combine. I try the LEDR diagnostic test (very useful in room set-up and speaker positioning problems) which confirms my suspicions. I tried various fixes and clipping a resistor accross the rear driver works wonders in my room. This combines with the impedence characteristic of the driver to roll-off the higher frequencies gradually in the rear driver. All moving coil drivers exhibit rising impedence with increasing frequency. The parallel resistor forms a voltage divider with this rising frequency. The higher the resitence of the driver gets, the less of the total voltage passes through it and more passes through the fixed resister. This results in the rear driver producing much less treble than the front driver (which is completely unaffected by this modification). Less treble fired backwards and upwards is less treble to collide with various nearby surfaces and bounce around delinquently before bashing into the front driver radiation and stirring it up. Perhaps Lothar could offer this as an option for buyers with small or cluttered listenning rooms; this is the only speaker ever to suffer from these problems in my room (I'd never entertain any Bose in here! ), but my room is not unique in having stuff, other than a plain flat wall, behind the plane of the speakers. The second successful fix (after various trials) uses sash cramps (large woodworking clamps) to mimic various potential bracing configurations. The most successful of these emulates a central vertical brace along the centre-line of the front baffle connecting to the centre line of the rear panel. This stops the unsupported area of the baffle being excited by driver vibration, particularly noticable due to the large radiating area of both these panels. The basic character of the speakers remains unchanged but their effectiveness as transducers of electical to acoustical signal is greatly enhanced. Knowing that I will shortly take delivery of much improved production versions of these loudspeakers liberates this reviewer to take liberties unbeknown in the normal realm of audio-reviewing. To modify a product submitted for review? Such heresy! But the designer acknowledges that the audio playthings presently lurking in my listening room are substandard. I am also aware that I shall shortly be moving into another, unfamiliar, listening room in the house I have recently bought. The bigger room will suit the Magna Acoustica and will be uncluttered by any intruding structures. After a few weeks Vincent emails me that the new batch of Magna Acoustica have arrived in Britain and he is able to drive up to the wilds of Derbyshire to deliver them. We meet at my new premises and unpack the new pair. Now these do look like £2,200 products. The cabinet is still built from marine grade 18mm birch-ply. The carcass has obviously been smoothed after construction and then veneered with a good quality figured maple veneer, indeed it looks more like quilted sycamore, it shimmers in the light. The drivers look similar but the dust cover is now glued in place preventing me from peering inside to check the internal construction quality. The brass spikes have been replaced by wooden ball-shaped feet and the drivers are now secured by socket head allen bolts rather than the previous philips cross-heads. They now look good. They now look like expensive speakers, not like poor DIY first attempts. Vincent takes time to help me establish the zone of neutrality in my new listening room so that we can place them provisionally before trying various positions for them. The room is sparsely furnished as yet so a little too lively and prone to flutter echoes. It has a sloping ceiling, which may mitigate the reflection problems I experience with the first pair of Magna Acoustica in my old listening room. 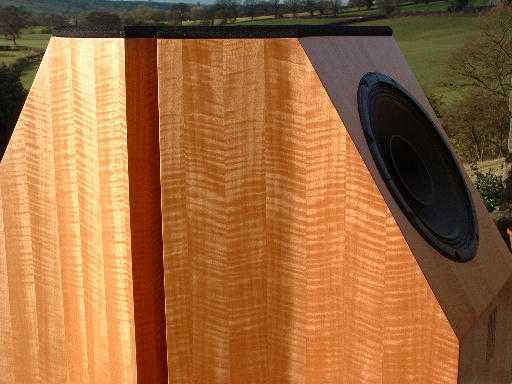 The plywood cabinet is basically the same design as the original pair; my own tests for Speaker Builder magazine in the 90s found plywood to be the best sheet material compromise, far ahead of mdf or chipboard. A centre-brace between the tops of the two drivers is also due to be added in future production, which addresses one of my findings from the first sample. The solid-core cable remains the same. It is manufactured from a slow-drawn soft material (not specified) and the positve core is "superthin" while the negative conductor is different "almost coaxial" says Lothar. The rest of the system is initially lashed up from my hotrod Rotel RCD965BXdiscrete feeding an old Classic Series A15 (an ancient Graham Nalty design, predating his Sonic Link designs) that usually serves only on my test bench as it is all DIN socket equipped. Loudspeaker cables are the supplied Magna Acoustica. This is just thrown together so that Vincent & I may check that everything is working and adjust the speaker positions. It is immediately apparent that this room permits more spacing between the speakers and less fierce toe-in. Even fresh from the box, fed by a theoretically unsuitable amplifier, Keb Mo sounds realistic, reasonably accurately voiced and with a soundstage appropriate to a singer with his guitar. Immediately it becomes obvious that this speaker does something special with male voices. This is often a strength of full range drivers, because they do not split the vocal range between two very different drivers right in the centre of the ear's most sensitive frequency range. In order to loosen the drivers a little I spin the Scratchy compilation. Old reggae & ska favourites are prime driver shakers, with plenty of bass, snare rimshots and fierce remixes. The multiple 250mm paper cone drivers take me right back to the sound systems of my youth. All drivers have unique sonic signatures (no matter how carefully designers work to make them trasparent) and big paper cones belong with reggae. This is a match made in heaven; it has nothing to do with hifi or accuracy, just fun and love of the music. For a while the Magna Acousticas will perform background tune duties while I fix things up in my new home, until they are ready for critical listening. This took more than 2 weeks of constant playing with the first pair, so patience is needed. However, in the bigger listening room these speakers are less fussy about spacing and toe-in. Once positioned in the zone of neutrality they are forgiving of surprising variations of toe-in or spacing, but unforgiving of even a couple of cm too close to the rear wall. Lothar is a big fan of Arvo Part and Miles Davis, and regular readers will know I am too. Having fetched my 4W single ended triode and Chevin Audio modified Shanling CDT100c, on goes Arfo Part's Spiegel im Spiegel. The vocal quality is sublime and the timing impeccable. This recording can really pull my heartstrings when reproduced appropriately and this equipment combination pulls it off perfectly. Little Feat's Waiting for Columbus is a variable quality live recording with some studio overdubs that I know really well and enjoy enough to play and play and play again. I enjoy listening to it again through the Magna Acoustica. I really enjoy this experience, which has to be what domestic audio is all about. Having established speaker positioning and realising these speakers will justify the effort of the full set up, I connect my newly reinstalled (with some more refinements to my old Origin Live wall support) current spec Michell Orbe, Hadcock 242SE, Decca Blue/Maroon (rebuilt by Len Gregory), feeding the Concordant Excelsior pre-amp, driving 7M of screened cable to the Consonance cyber100s (review due shortly, if you're reading this after it was posted the Consonance reviews could be on the site already). The needle drops on If DJ was your trade, various artists produced between 1947 & 1977 by Bunny Lee at King Tubby's (a recent 180g Simply Vinyl reissue) and skanking was witnessed throughout the land. No adjustments necessary, no tweaking, no fine-tuning of the Hadcocks lateral balance, no paranoid vta faffing, just great grooves in my house. The Decca is coloured and resonates like a really resonant thing on a day-of-resonance outing but its speed is legendary and the Magnas communicate this to the room. These are testing times though, so the Academy of Ancient Music's recording of Beethoven's glorious Ninth Symphony lands on the platter, but sadly without aplomb. The Decca struggles to track the dense dynamic swings, which doesn't help, but the complex orchestral textures draw attention to the Magna Acousticas typical paper-cone colouration, which begins to dominate the massed voices too. While the Magnas excel with solo voices they just don't have the transparency for massed choirs. Even the Cartridge Man's MusicMaker II (a confident tracker under any circumstances) merely confirms the situation. I have heard this recording best on active speaskers with Decca London Ribbons & Focal 10N501s and the information is there on the vinyl, but hidden by this system today. Trying something in between these two styles of music and recording presentation I spin the Verve Remixed compilation. There is something about the chutzpah of any DJ or mixmaster taking on these iconic tunes, but that's the jazz tradition; take the standards & rework them and make them new again. Billie Holiday's Strange fruit always brings a lump to my throat and sometimes even a tear to my eye. It does again today. Then comes a critical test of dynamics (both macro & micro), timbre (the correct reproduction of instrumental instrumental timbre is most easily marred by loudspeaker cone or cabinet colouration), pitch stability (upset in speakers by intermodulation distortion, which is worst with full-range drivers) and timing: solo piano. I adore Ivan Klansky's rendition of Janacek's On An Overgrown Path, and indeed I fell in love with my partner while listenning to Klansky perform it in Nottingham. Tough test. The timing is spot on. The paper cone colouration is obvious, but possible to hear through. The percussive piano on this recording draws attention to some cabinet colouration on the climaxes, the distinctive signature of that unsupported baffle-width reacting to the driver forces transmitted through the allen bolts. There is far less compression than would be really obvious from a compact 2-way; the dynamics can startle the listener. The promised brace in future production should help here, but not as much as a full height vertical brace might contribute. These are really cleverly functioning speakers that do not subscribe to any of the prevailing 21st century speaker hegemonies. The bass loading (most speaker designers' biggest juggling act) seems to combine various mechanisms (whether by accident or design). The bass loading performs like a combination of open-baffle, tuned quater-wave pipe and helmholtz resonator in harmony with the distinct baffle response step defined by the straight sharp-edged baffle sides and floor reinforcement. The opposing drivers tend to cancel each other's distortions and reactive forces (like amplifier push-pull output stages), rendering spikes less important. The cabinet material is hard marine-ply, consistently the best material in tests, including my own. The dual cone 25cm (10") bass units provide the equivalent radiating area of a 33cm (13.5") single bass driver, but with the transient and high-frequency benefits of the smaller diameter. Furthermore, the smaller units also enable a 25mm (1") voice coil possible (unheard of in a 30cm driver) permitting wider high frequency dispersion. The high frequency output from the rear driver excludes this speaker from use in small rooms. The upward slant of the rear driver also precludes use in any room where early reflections may interfere with the front driver high-frequency output combining to produce comb-filter effects, that upset frequency balance, timbre and soundstage. Readers should only consider joining the Magna Acoustica club if they have a big enough uncluttered listening room, although a new compact single driver version is due to be launched this year, specifically tailored to smaller rooms. The Magna Acoustica really sing when fed by flea-powered single ended triodes. My homebrew 4 watter never sounded better than via these big speakers. My Assemblage SET300B sounded as fine as it is able too. The more temperamental one's little triode power output valves & iron, the more they'll be helped by the Magna Acoustica. Big power solid-state class AB muthas need not apply; they're better suited to wide bandwidth low distortion and low colouration conventional designs, high sensitivity speakers like the Magnas tend to exaggerate the crossover distortion of amplifiers not biased far into class A. The Magna Acousticas are not low colouration near-field monitors. They would not be suitable for evaluating recording quality, but they would render most recordings enjoyable. The gently rolled off bandwidth, both top & bottom, limits their capabilities with large scale orchestral works, if they're your main staple listening you'd find more suitable speakers elsewhere. They do have excellent pace rhythm & timing, bouncing rhythms along. The Magna Acousticas do not tend to favour any type of music over any other...except their perfect match with old ska and reggae...and their sublime vocal rendition with the right amplifier. If you're a listener who needs high sensitivity and can listen through the characteristic signature of big paper cones these represent a welcome alternative to horns. Single ended triode owners need not be restricted to old-style speakers like Lowther Acousta or Altec Lansing Voice of the Theatre while a new generation of bottleheads continue to develop new solutions to the high-sensitivity speaker connundrum. "Thank you for your review. We are in fact now exploring options of a smaller model with single driver. Equally we are looking into the option of giving customers the choice of using the grille or to seal the speaker and listen as infinite baffle. Both ways have their own merits in fact and resolves room problems further. The lacquer is changed now to scratch proof Polyurethane. Two bracings are added, just on top and below the drivers as well."